On the 25th I had the opportunity to attend a German wine tasting luncheon hosted by the German Wine Institute and Master of Wine Jeannie Cho Lee at Bao Bei Chinese Brasserie. The press conference was a precursor to the launch of Jeannie’s Perfect Pairings German Wines & Asian Flavours booklet and a German wine promotion in sixty of the BCLDB shops for the month of May. 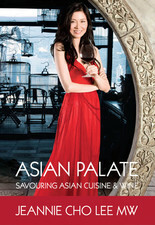 The fifty page booklet encapsulates many of Jeannie’s concepts on wine and Asian food pairing from her hard to find book Asian Palate voted Gourmand’s Best Food and Wine Book in the World. The original English version is currently out of print but available on itunes if you have an iphone or ipad. Sweet, Sour, Salty, Bitter, and Umami and how they pair with the cuisines or as this MW states “the terroir of cities” especially food from Canton, Shanghai, Northern China (Xinjiang and Heilongjiang), as well as Japan, Korea, Thailand, Singapore, and India. Sweetness is found in fruit, palm sugar, and coconut sauces; sourness from tamarind or lime; saltiness from soy, oyster sauce, and pungent shrimp or bean pastes. Bitterness from ginkgo nuts, bitter melon, and ginseng. Umami or the "fifth" taste is the savoury quality of fermented beans, mushrooms, and seaweed. Jeanne opened my palate to her concept of “roving chopsticks” where during the course of an Asian meal you experience a combination of small bites with varied flavour combinations of the communal table. The flavours, textures and temperatures of main dishes along with a myriad of condiments makes for a very complex food and wine matrix compared to western cuisine. With multi course dishes Jeannie recommends a wine that will pair with 60 to 70% of the dishes. The wine needs to be versatile and flexible and Riesling is the perfect bridge builder. The first course of our luncheon was a combination of plates of pickles, Sichuan cucumbers, marinated eggplant and tofu skin. These cold and marinated dishes were elegantly paired with a Riesling Sekt. Straw yellow with fresh yeast and apple notes. Light-bodied, crisp lively acidity, apple, lemon, lime, and floral notes. Vegetable potstickers and steamed prawn and chive dumpling were nicely paired with a couple of Rieslings from the Nahe and Mosel. I found the trocken better paired with the potstickers and slightly off dry Mosel a complex marriage with the steamed dumplings. Straw green with subtle petrol notes. Medium bodied, dry, with grapefruit, lime sorbet, and mineral notes. Straw green with ripe apple and faint petrol notes. Medium-bodied, off-dry, with lime and flower blossoms. A complex dish of cold tofu with black bean, green Sichuan peppercorn ground pork, with Shimeji mushrooms and garlic chips as well as King pea tips with garlic and Shaoxing were paired up with a Pinot Blanc and an Auslese Riesling. The sweetness of the Auslese was the perfect pairing with the heat from the peppercorn pork. The Pinot Blanc battled the spice but was an excellent match with the tofu. Straw green with aromas of apple, petrol, and citrus pith. Medium-bodied and dry with grapefruit, mineral, and nectarine notes. Straw yellow with aromas of honey and barley sugar. Medium-bodied, sweet and lush, with barley sugar, honey, and sweet ripe apple and a hint of petrol in the long finish. Two Pinot Noirs, from the Pfalz and the Rheingau were paired with a crispy pork belly and lotus root dish. The light tannins in the reds brought out the spice and earthy notes of both dishes. Cherry red with simple aromas of herb, dried red currant, and a hint of meatiness. Light-bodied with hints of meat, cedar, red berries, and floral herby notes. Ruby red with aromas of spice, smoke, and cherry. Medium-bodied, quite complex with spice, autumn wood smoke and red cherry notes. The final lunch pairing was Mosel Kabinett, that despite not having a lot of sweetness, was perfect with the Youtiao (Chinese donut) and its light fresh bread complimented the wine wonderfully. Straw green with lovely lime and petrol notes. Medium-bodied, crispy acidity, petrol, green apple, and pineapple. Pick up a copy of Perfect Pairings and try a selection of German wines paired up with small bites from Bao Bei this week at the BCLDB on Saturday May 5th from 3 to 6pm at the 39th and Cambie Signature store. Jeannie Cho Lee's book is free of charge and of limited availability.